Two publications within a day - four in one month; both new records for me. 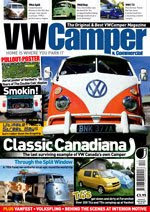 My flash fiction story It's A Sign, that I originaly wrote at the Eastercon flash fiction workshop, appears today in VW Camper & Commercial. My family have three campervans between them, so VW & SF is an ideal combination!